It was the 17th of January, 2017 – 17-1-17. The day that my life changed. It started last year in December when I received a bowel screen test and the results came back positive. I was not worried because this had happened before – but then the doctor said I needed a colonoscopy. I was booked in for January 17. After surgery, I woke up in the recovery room with a nurse next to me – I felt fine. But then my husband Dave arrived, followed by a doctor and another nurse. The curtains were drawn and they told us they had found cancer. Is this for real? I felt healthy. Things started moving too fast. I needed a full body scan and blood tests, and I had an appointment to see a surgeon. After multiple attempts at a nurse injecting dye for a pet scan, I was bruised, sore and in shock. How did I tell the kids? Who else do I tell? What happens next? The scans found that the cancer had not spread – a silver-lining in my diagnosis. The next day while sitting in the waiting room to see a surgeon, I looked around to see so many unwell people there. I still felt fine and completely out of place. It was decided that my surgeon would cut out the tumour and lymph nodes to test. I have bowel cancer. This is a statement, a fact, that keeps coming to mind. I cannot change this but I thought – I can beat this. I know the risks but I focus on the positives – I am fit and healthy and it was detected early. There are no signs of the cancer spreading. Four days out from the operation, I still had no symptoms. No fatigue, no bloating, no pain, no blood. Having never been very sick or never having surgery or much time in hospital, I didn’t really have anything I could crystallise to be afraid of. I thought of how I felt when my daughter Danielle was about to be born – I know something very big was about to happen and it would be painful, but all going well I would have a good result. I was aware of risks but not focused on them – this is generally my approach to life. When February 1 arrived, I headed into surgery and came out to see Dave and my two daughters, Danielle and Emma – a huge comfort. The next five days was spent recovering, taking one day at a time. I took my first steps again, venturing outside the room and started to improve. By day five, the results had come back on my lymph nodes and unfortunately it wasn’t good. My doctor said I would need chemotherapy – another bombshell that I was not expecting. I thought I was better and I felt better. On day six after surgery I went home – no more needles or bells – just fresh air, my dogs, family, and a comfy home. As I start to prepare for my next surgery, followed by chemotherapy, I remind myself that life does go on. If you receive a bowel screening kit, use it. It’s a simple test that may save your life. 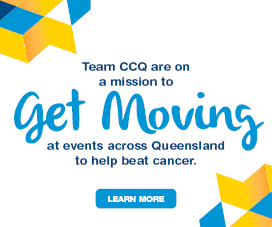 In Queensland, around 3000 people are diagnosed with bowel cancer every year. 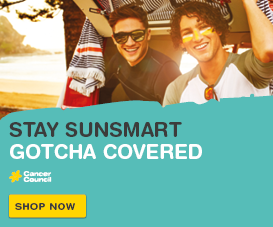 If detected early up to 90 per cent of cases can be successfully treated. Not everyone who experiences these symptoms have bowel cancer. If you have experienced any of these symptoms for more than two weeks, visit your GP for a check-up. Eligible Australians aged 50 and over will receive a bowel cancer screening kit by mail containing a Faecal Occult Blood Test (FOBT). We recommend all eligible people take the test, every two years. 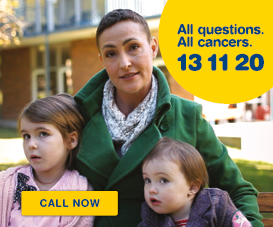 For more information about bowel cancer, or support, phone 13 11 20.